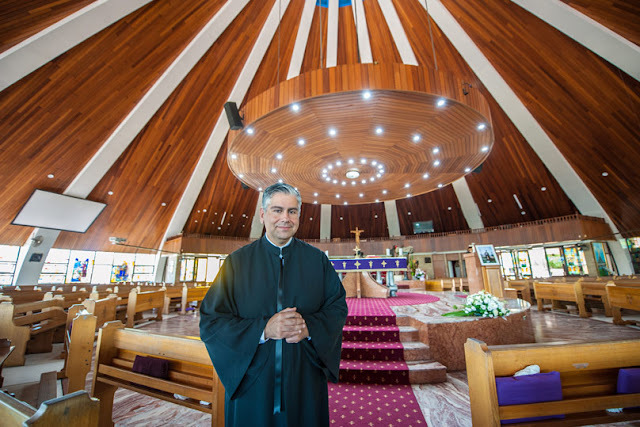 Engineer Danny Nouh is to become Australia's first married man to be ordained to the priesthood in the Maronite Catholic Church. Danny Nouh first thought seriously about the priesthood when he heard Jesus knocking on his front door. Literally. Asleep in bed one night, he heard a loud knocking on the front door of his house. It sounded just like the knock he'd heard on the Arabic-Christian TV channel, where Jesus is depicted knocking on a door at the beginning of the regular rosary segment. Thinking maybe he dreamt it, Danny went back to sleep. Yet, again the knocking came. Extremely loud. "I was alarmed. I didn't know what it was. But there was no one there. To this day I don't know. I might have been dreaming. I can't explain it." Nine years later, Danny is about to become the first married man to be ordained to the priesthood in Australia for the Maronite Catholic Church. He is set to be ordained at Our Lady of Lebanon Co-Cathedral in Harris Park on 17 March. When he first heard that knocking on his door, Danny's wife Nabiha and their three children had been asleep in the house also, but he was the only one who heard it. "My wife was right next to me. Everyone was asleep. My children were in the other room. The first time I was panicking and I was startled. But the second time, again I heard it and this sense of peace took over me. I just knew it was Jesus." Danny believes that was the call to priesthood. At the time however it was confusing. "I thought why are you calling me? I'm married, I have a big career. Out of all people, why are you knocking on my door?" 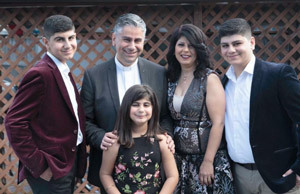 After much discernment and spiritual direction, Danny was ordained as a sub-deacon in 2016 by Bishop Antoine-Charbel Tarabay. He was also appointed Executive Officer of MaroniteCare, the welfare agency of the Maronite Eparchy of Australia, based in Harris Park. This meant a massive drop in salary for Danny, after working for many years in the engineering industry. "It was a third of what I'd been earning but I've never been happier. If this is your vocation, God will always provide." Danny says he owes his priestly vocation to his family, in particular his wife. When the time came to tell her he wanted to become a priest, Danny says he was trembling. "I was so confused. I didn't know how to break the news to her." However, Nabiha took him by surprise. "She looked at me and said, 'I know what you want to tell me. You want to become a priest'." Danny Nouh, his wife Nabiha and their children. "It was extraordinary. We both started crying." "My wife is the reason my vocation is what it is. She's a very joyful person. Just a beautiful soul." Nabiha had to give her written permission to the Bishop before Danny could proceed to the priesthood. In the Maronite Church married priests have traditionally been the norm rather than the exception, particularly in the country of its birth, Lebanon. "The Maronite Church was built on this tradition. If you go to Lebanon, the priests in the villages would always either be married or they would be monks in monasteries." Celibate priests were rare until about a century ago. Danny says it is the Eucharist that drew him towards the priesthood and his desire to bring Jesus to others. "The sacraments are very important to me, the celebration of the Eucharist. That's where I draw my strength and peace." "This is my mission-to bring Jesus to anyone who's in need. I want them to know Jesus. That joy you receive from knowing him."